Near and far. Out and back. My kitchen and my horizon. Karen Kitani Harsbo and Marianne Krumbach’s seemingly opposite ceramic expressions meet in depictions of the concrete and mapping of the intangible. 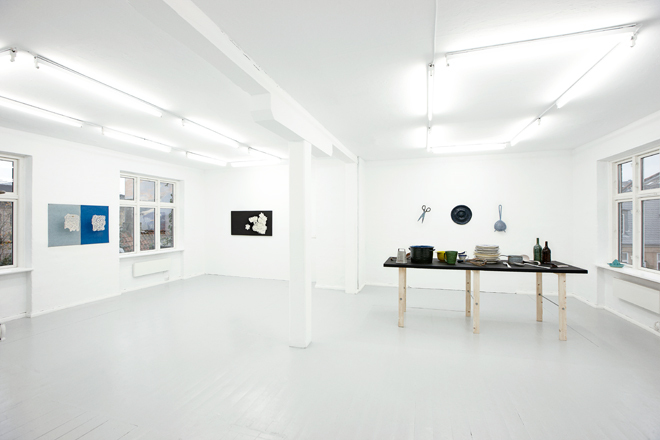 The next exhibition at Copenhagen Ceramics is a meeting of the near and the distant. Between the absolute concrete, the kitchen and its utensils as metaphysics, and the metaphysical, the landscape of emotions made very concrete and tangible. The ceramics of Karen Kitani Harsbo and Marianne Krumbach are seemingly opposites both in their formal expression and treatment of material, but on closer inspection their works complement each other perfectly as pivots in a familiar dynamic. Out and back – being at home and away. ’ I am interested in kitchen utensils from a sculptural point of view, because, to me, they obtain new meanings and qualities by being transferred from the utility domain into a sculptural, artistic context. 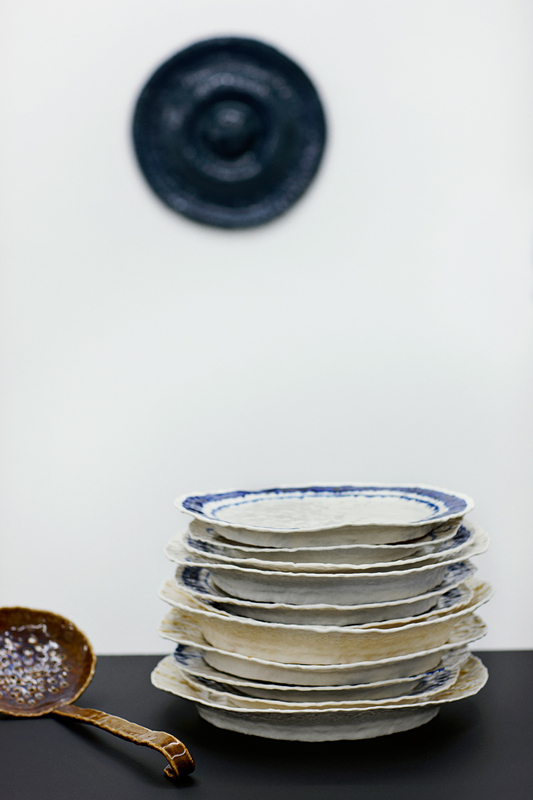 They stay what they are, plates and cooking pots, while – as images – they are being liberated from this very status ’. Krumbach is an interpreter. She has formerly worked with scenes of nature, where the perception of a tree, the mountain or the waterfall was at the centre. Nature through human perception. Now, she is into utensils, but with the same focus, the perception of objects. Of things we are very familiar with and have touched again and again; things carrying memories and inherent narratives. A still life painted in ceramic strokes. Karen Kitani Harsbo looks outwards and inwards in her works. The starting point is the horizon - to expand your horizon. Literally, as when travelling out, looking for new experiences, new worlds. To be curious, following a map. The map as description of the world and as a way of viewing the world. It is the fascination of mapping itself that occupies Harsbo. 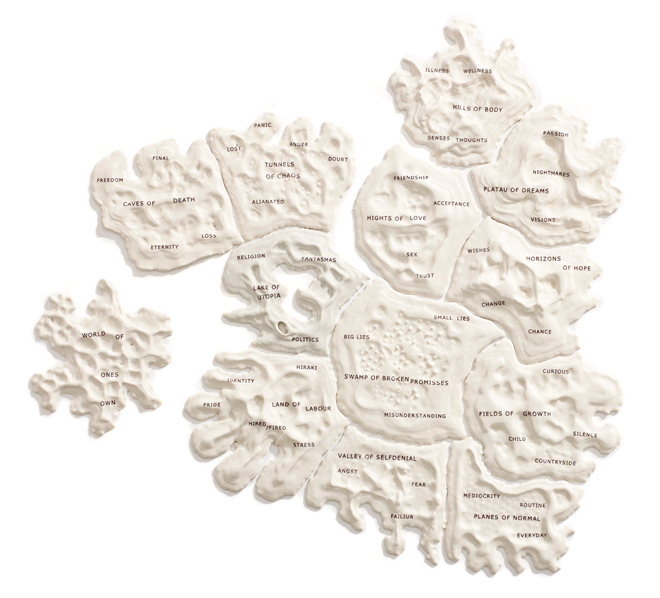 In working for this exhibition she has been inspired by older maps, where the geographical map is used to describe very different landscapes from the physical ones, e.g. the Carte du Tendre, which is an allegorical geography - a description of the landscape of Love – made in the 17 century by French noble women. Another example is the Hereford Mappa Mundi from the 14 century, in which geography, cosmology and the stories of the Bible are intertwined. 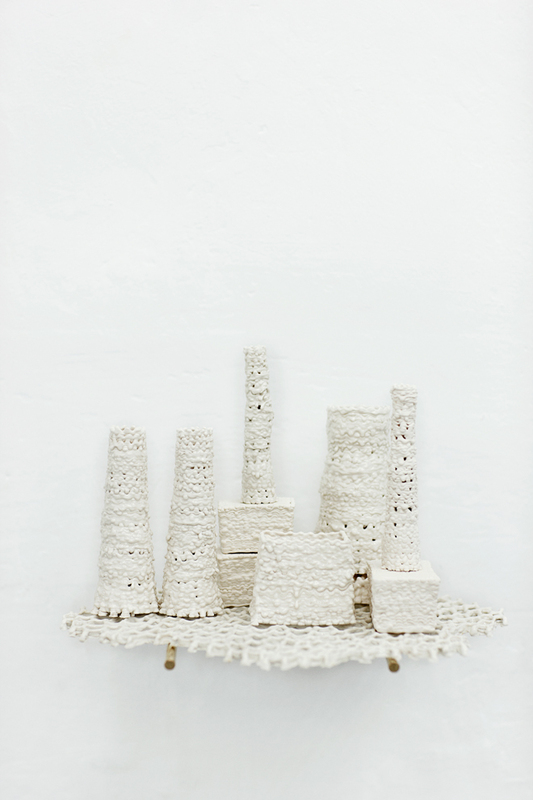 Karen Kitani Harsbo uses the idea of mapping to make a physical ceramic landscape of her life. With interchaining islands named with different emotions and influences, f. instance: Hills of Body, Fields of Growth, Swamp of Broken Promises, Land of Labour, Plateau of Dreams, Valley of Self-denial, Horizons of Hope, and many more. Marianne Krumbach has exhibited her works widely in Denmark and abroad, e.g. Pop-up, Hurrah? ! 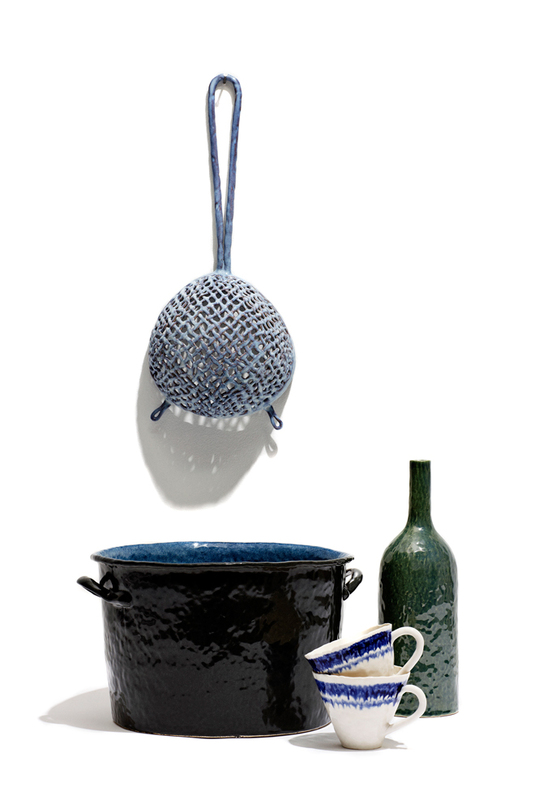 , Los Angeles, 2013; Summer exhibition, Chi Chi Potter, Cph, 2013; New Nordic Narrative, Keramikmuseet Grimmerhus, DK, 2011; Pynt, Officinet, Cph, 2013;The Spring Exhibition, Kunsthal Charlottenborg, Cph, 2010. She has received several awards and grants, e.g. from The Danish National Bank, and the Danish Arts Foundation in 2013. Karen Kitani Harsbo is associate professor at the Royal Danish Academy of Fine Arts. She has a long career of exhibiting, e.g. Betroet Tvivl at Vejen Kunstmuseum, DK, 2013; British Ceramic Biennial, Stoke on Trent, UK, 2013; Entropisk Topologi, Ann Linnemann Studiegalleri, Cph. 2013 ; Happenstance ( w. Neil Brownsword ), 2012. She has executed a series of public commissions, f. inst. the brick sculpture Cross Over at Urban Planen in Copenhagen in 2009. Also she regularly acts as exhibition curator, being behind important exhibitions such as ’The Magic of Clay’ at Gl. Holtegaard, DK, 2011. The exhibition will be opened on Thursday 20 November at 5 pm by Mikkel Bogh, Director of the Danish National Gallery.